The most popular way to watch TV these days is a direct-to-home satellite service, giving you access to regular channels and programming for a monthly fee. It’s seamless and usually works. Save for the occasional weather-related outage. And brings you pre-programmed and curated content with no effort to you apart from flipping channels on a remote. But the last few years have seen the internet grow into an excellent place to get on-demand content. You get access to much more quality television content through various online channels, all on demand and easy to access. The biggest advantage of this is being able to watch what you want when you want, without having to adhere to the schedules and availability factors that typically affect programmed content on regular channels. It’s what has led to the growth of smart TVs, dongle-based devices such as the Google Chromecast and Amazon Fire TV Stick, and internet-based content providers such as Netflix, Hotstar and Amazon Prime Video. However, all of this means you either have to buy an expensive smart TV or deal with multiple devices plugged into your TV. That’s where Videocon comes in, hoping to make your TV table a little easier on the clutter. The HD Smart Connect set-top box combines the capabilities of the traditional set-top box with the smart functionality that you could expect from a device such as the Chromecast or Amazon Fire TV Stick. It also competes closely with the Airtel Internet TV, which offers similar features and comes from a direct competitor of Videocon. But how does the Rs 3,490 Videocon d2h HD Smart Connect set-top box fare in our review? Read on to find out. At its most basic level, the Videocon d2h HD Smart Connect is an ordinary set-top box that gets the basics right. It does need to be connected to a properly-placed satellite receiver dish, which will need to be at the top of your building, and receives the bouquet of channels offered by Videocon, depending on what channel pack you subscribe to. With services on-par with what other service providers offer, neither is there anything special on offer here, nor is there anything to complain about. 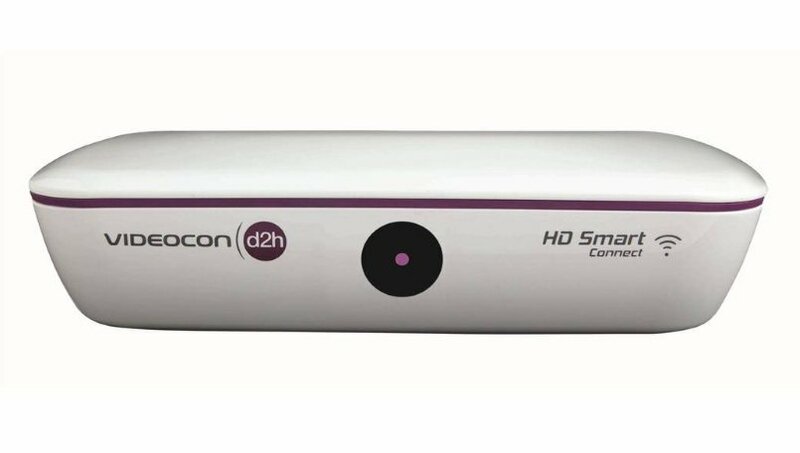 However, the HD Smart Connect box is priced at Rs 3,490 (Rs 2,490 if you’re already a Videocon d2h user and are upgrading from an existing box), compared to the Rs 2,020 you would pay for the ordinary HD set-top box. Your extra Rs 1,470 buys you the smart connectivity options on the set-top box, which allow you to access smart functions through a single device using the same remote that you use to control the direct-to-home satellite TV service. The device is simple in terms of design, with nothing much on the front apart from a logo and an LED indicator light. The back has the connectivity options, including USB, HDMI, Ethernet and more. Connecting an expandable storage device such as a hard drive or USB stick into the port will allow you to use the device as a digital video recorder, and you can ordinarily also read content off the USB drive to play on your TV, in case your TV doesn’t have a USB port of its own. The interface is standard and lacks much in the way of design and navigation. It can occasionally be complicated to move around, since the box itself is a bit slow to respond to commands and needlessly convoluted in the way everything is laid out. I often found myself needing to switch to d2h before going back into the smart interface, simply because I could find no easy way to move backwards within the interface itself. For the time being, the app selection is skeletal at best. While Hungama Play works well, the rest are fairly unnecessary for a smart TV box and are better accessed on a smartphone or PC. Smart TV boxes need to focus more on apps that deliver quality content, and unfortunately Videocon is sorely short on these for the time being. There is also a screen mirroring feature, which lets you replicate your phone’s screen on the TV. This is perhaps the most useful feature on the device, but requires a strong internet connection to act as a bridge between the two devices. A lot of the trouble we had with the Videocon HD Smart Connect box could be blamed on my not-so-fast internet connection, and this improved a bit when I used my smartphone as a hotspot instead. However, in a country where internet connectivity is often slow and unreliable, the box’s shortcomings will be particularly highlighted. Considering the cost of the Videocon d2h HD Smart Connect set-top box, there isn’t too much to complain about. If we assume that you’ll be buying a set-top box for your TV anyway, it might make sense to spend a little bit more and get the Videocon d2h HD Smart Connect for its additional functionality. However, if you already have a smart TV, or if price is no bar and you can spend a little bit more to get a Chromecast or Amazon Fire TV Stick, you’ll find the smart functionality in those cases to be superior to what is on offer with the Videocon device. While there is a lot promised, at the moment the Videocon HD Smart Connect box is too simple and unrefined to take seriously as an alternative to other smart TV enabling devices. You’re better off with one of the big alternatives for the simpler and more seamless connectivity, and the poor performance with low-speed internet is a serious cause for concern with the Videocon device. Think about it only if your use of smart TV functionality is limited to screen mirroring and USB support, or wait till more services have been added before picking this up. However, also consider the Airtel Internet TV box, which offers a similar set of features.